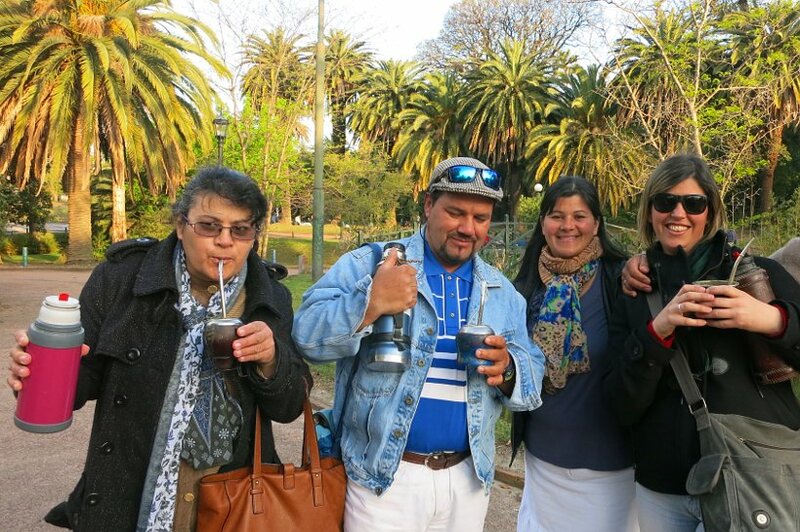 One of the things that has been fascinating to observe in Montevideo, Uruguay is how obsessive Uruguayans are about drinking mate. They can been anywhere and at anytime of the day walking around clutching onto a thermos flask and slurping from leather mate cups. 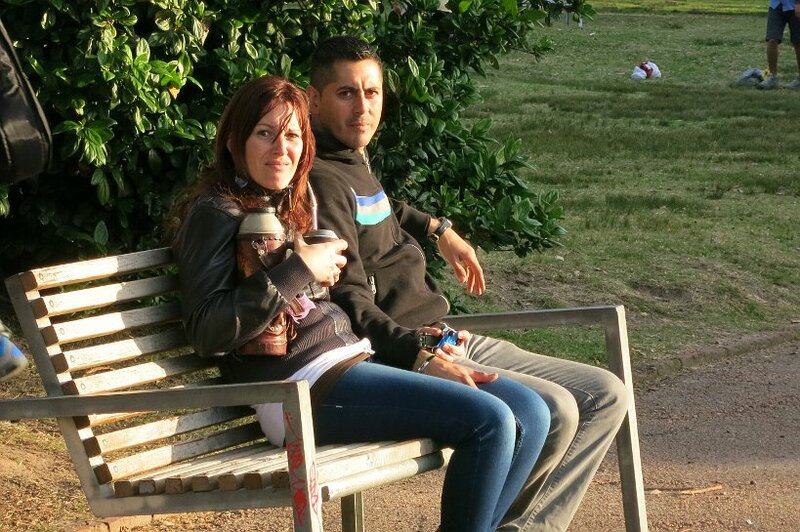 We had heard about mate when we were in Argentina, but had not seen the same level of obsessiveness in Buenos Aires, the capital. We were under the general impression that drinking mate was something that was consumed more frequently outside of the big city and in the provinces. 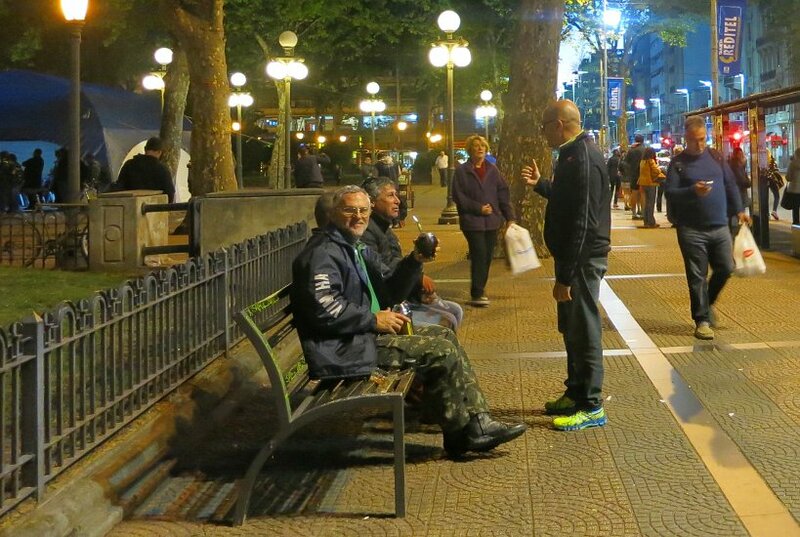 So, when we arrived in Montevideo, the capital, we were taken by surprise at how much the Uruguayans are drinking mate. Their attachment to the thermos flasks and mate cups knows no boundaries. We see people driving while drinking mate, riding the bus with their mate cups, pharmacists drinking mate while attending to patients, policemen on duty sipping mate and we even saw someone riding a motorcycle while drinking mate. This national addiction needed further investigation. But First, What Is Mate? Mate is a drink that is made from the infusion of yerba (dried mate plant) and hot water. “Yerba” is basically dried leaves and twigs from the tree species llex paraguayensis. It’s like coffee in that it has caffeine, it’s like tea because it is steeped in hot water, but that’s where the similarities end. 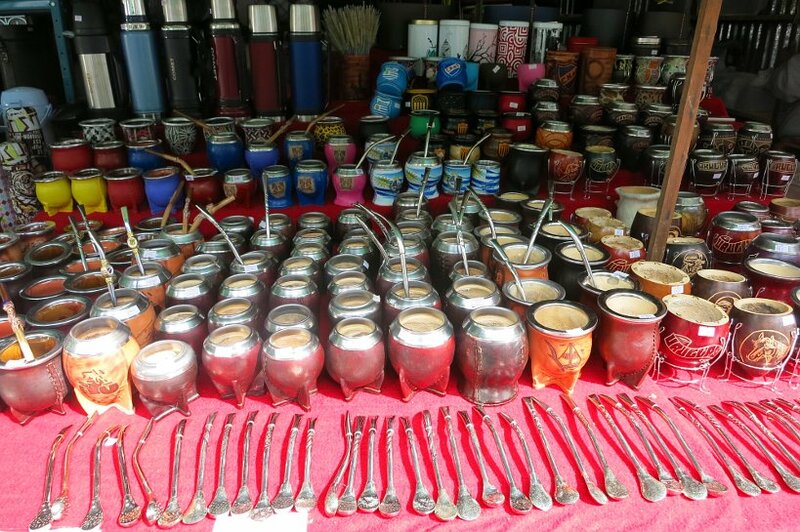 Unlike coffee and tea, mate is generally shared and the same gourd and bombilla (metal straw) are used and passed around from one person to the next. The caffeine content in Yerba mate is in-between what one would find in coffee and tea. It is highly nutritious and contains Vitamin A. It is also a diuretic and used as a stimulant to reduce fatigue and suppress appetite. It is also said to help boost one’s metabolic rate and has a host powerful antioxidants that boost immunity and protect against colds and flu. The herbwisdom.com blog goes into much more detail about the health benefits including benefits such as weight loss and reducing the signs of aging. Check them out for more information or you can watch this short YouTube video from Circle of Drink also on the health benefits of mate. Yerba mate is available everywhere and the aisle in the supermercado is highly impressive. 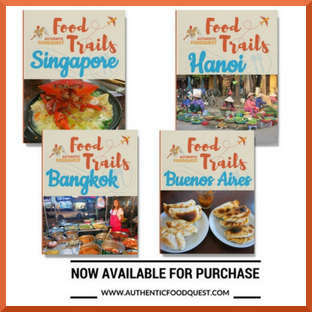 You will find all different types, varieties and brands to choose from. 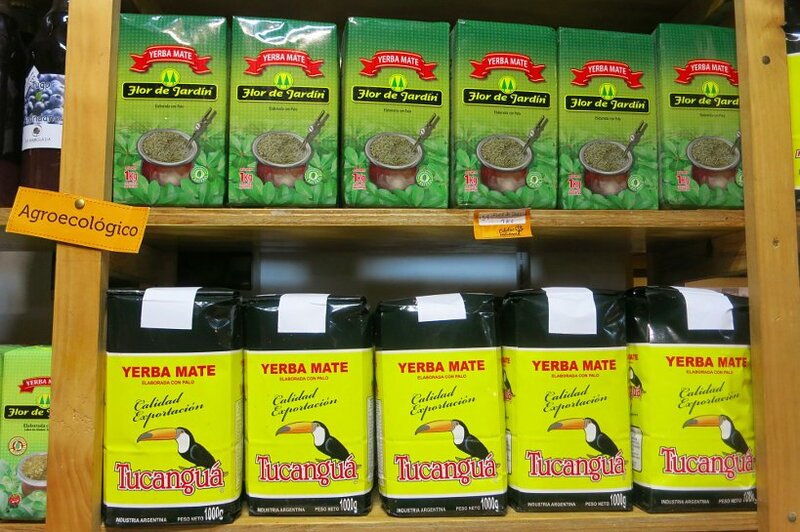 There is no shortage of supply for Yerba Mate. The cup or mate is both the name of the drink and the drinking vessel. It is made from a dried calabash gourd, that must be “cured” before being used to drink the infusion. Two things have been striking about the mate cups. The first is how widely available the mate cups are. 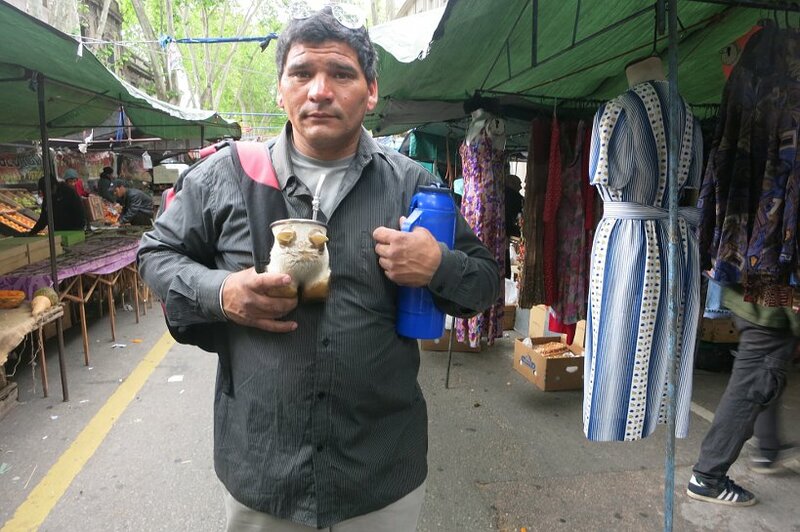 Everywhere you look, in stores, and on the streets, there are people selling mate cups of all different types. The second most striking fact is the unique personalization of each cup. Every single mate cup we saw was distinctly decorated. 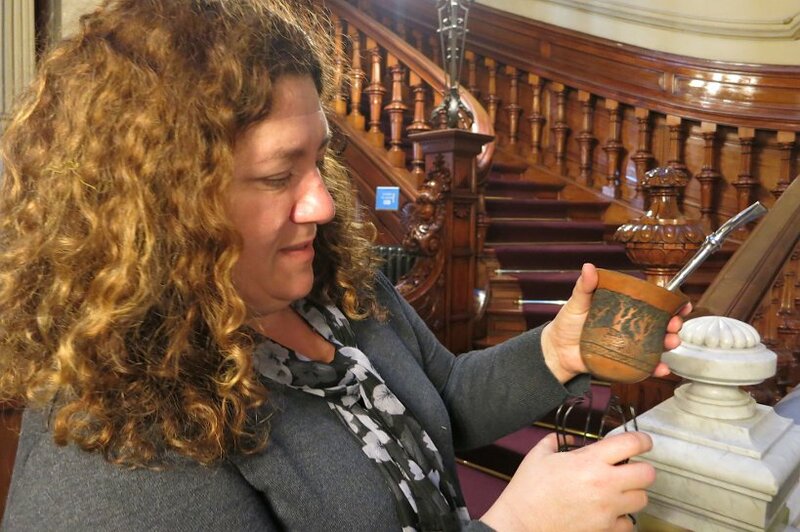 We talked to a lady who showed us her cup with the inscription of “2010”, which she shared was the date her child was born. A very personal date inscribed on a very personal item. This is a kind of metal straw and is the instrument used for drinking mate. They are generally silver and made of metal. It consists of a “neck” or tube with a filter (think tea infuser) and a mouthpiece at the end. The thermos flask is used to keep the water hot for several hours. 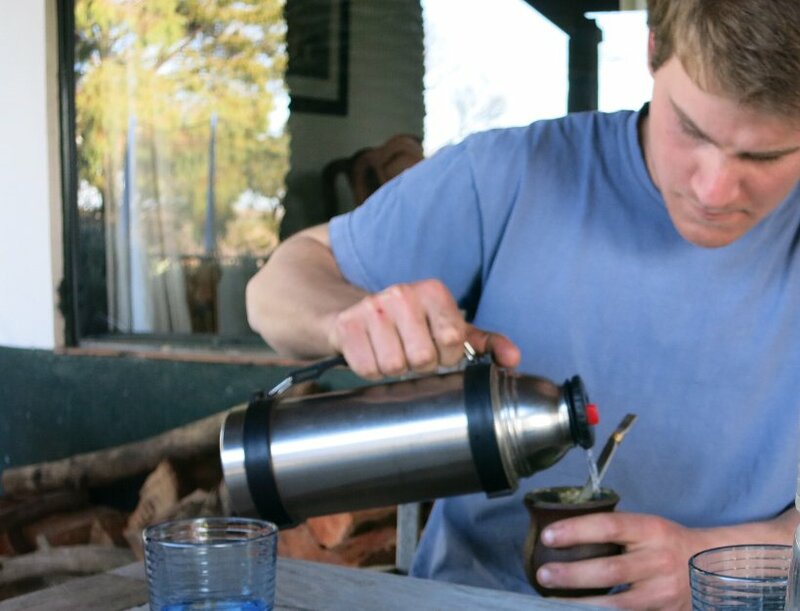 Apparently, Uruguay developed the use of a thermos flask with a tubular spout, which led to the abandonment of the kettle and the rise of mate consumption on-the-go. To prepare a good mate, the gourd is filled approximately ⅔ with yerba. The yerba is them tilted on one side and a little hot water is added to help place the bombilla. Once the yerba swells the hot water (not quite boiling) is poured into the gouard to obtain the infusion. Afterwards, the cebador (preparer) tastes the first brew before passing it around. Once empty, the gourd is filled up again with water and emptied again until the yerba is washed out and loses flavor. To be able to dig deeper and understand why Uruguayans walk around clutching their thermos and slurping mate, we went to the experts as well as talked to locals. 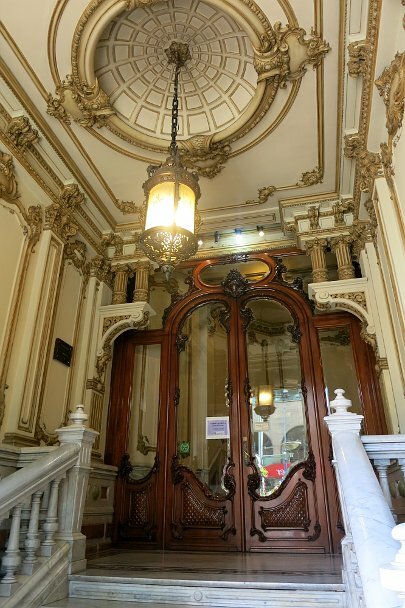 Montevideo has a museum dedicated to mate. 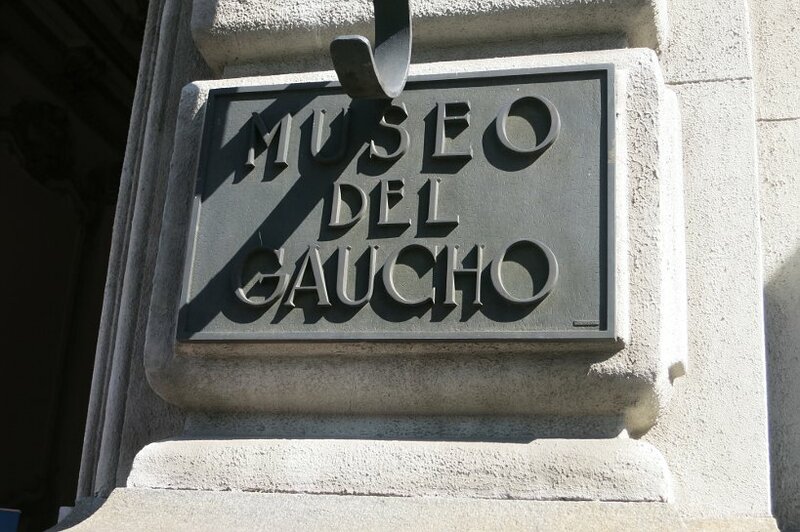 It is found at the Museo del Gaucho y la Moneda, located in the Centro barrio (neighborhood) at 18 de Julio 998. This is a beautiful palatial building that is divided into two main parts. The Gaucho Museum section on the top floor and the interactive Money Museum section on the second floor. 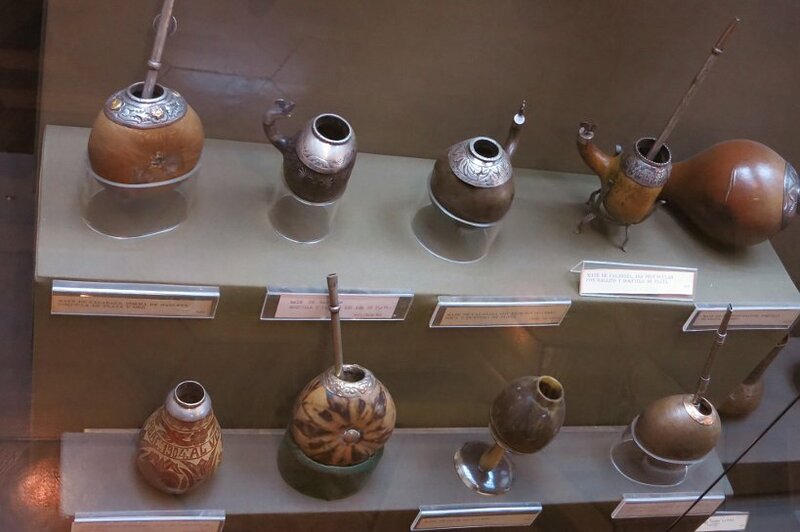 The in depth exposition about mate found within the Gaucho museum section was the perfect place to get the back-story about mate. 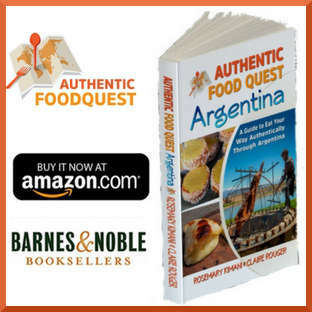 The origins of the drink date back hundreds of years to the Guarani Indians of Paraguay, Southwest of Brazil, Northeast of Argentina and parts of Bolivia and Uruguay. The Guarani’s used to take mate for it its energizing properties. Legend has it that, one day, an old nomad man was too weak to keep following his tribe and decided to settle down with his daughter Yarii. They soon ran out of food. One night, a stranger visited them and asked for food and shelter. The old father and his daughter generously gave away the food they had left. Surprised by such hospitality, the visitor, who actually was Tupa, the Guaranis’ supreme god, offered them a plant he created to make a special kind of tea, so that they will never be thirsty again and always remain healthy. He also told them to share the beverage with the others from the tribe. Since then, mate has been synonymous with health, endurance and sharing. 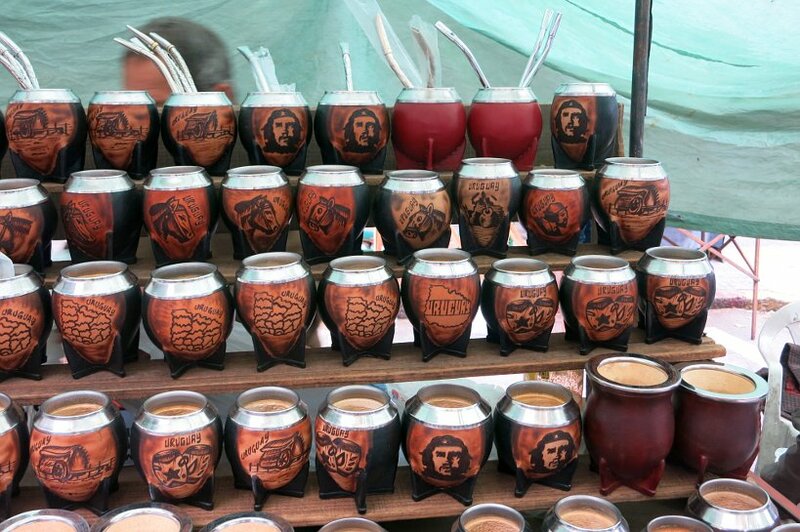 While mate is consumed in several South American countries, it is Uruguay that presents the largest consumption of mate per capita. Figures indicate that 85% of the population is drinking mate daily. 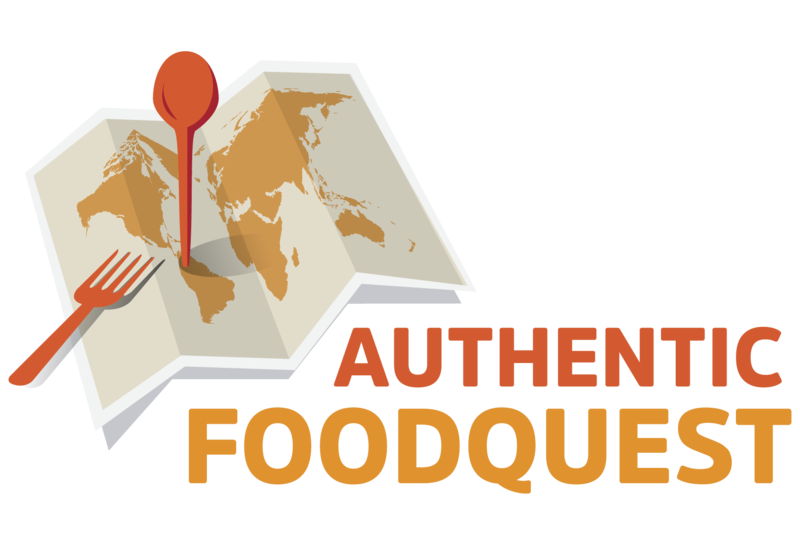 Nearly ten kilos is consumed per person per year, resulting in a total national consumption of about 29 million kilos per year. 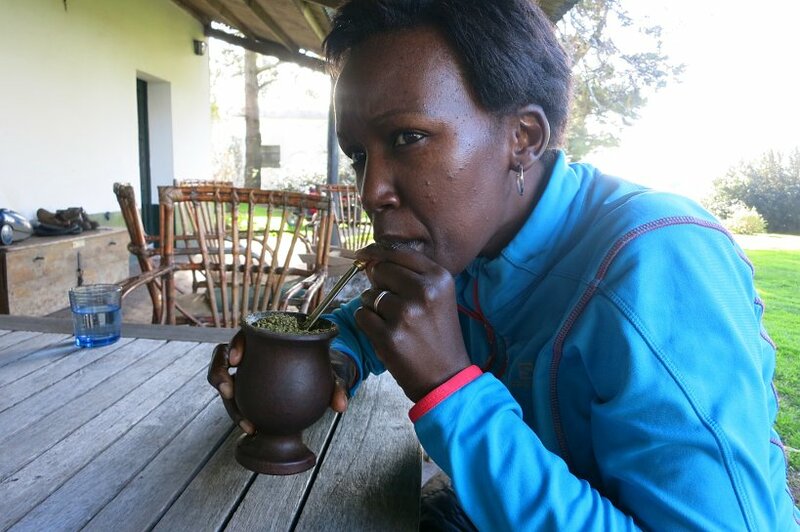 To understand first hand about the national obsession with mate, we interviewed and asked local Uruguayans to share with us their love for mate. 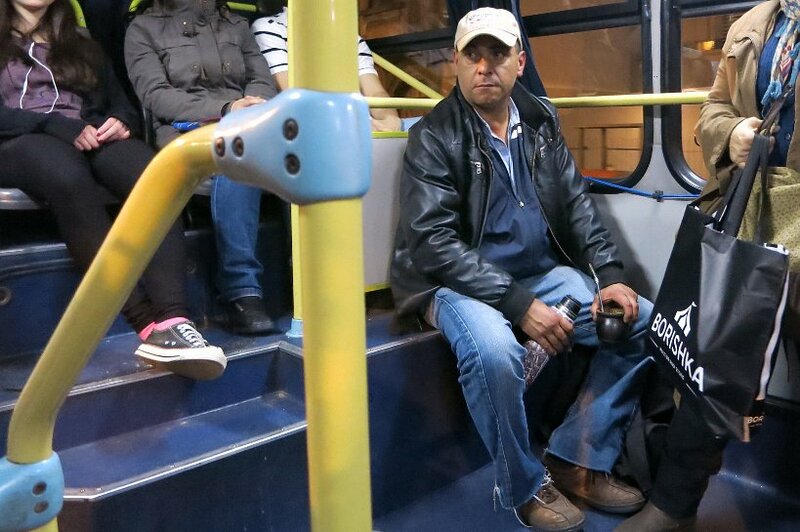 We approached people while walking in the streets and asked them why they drink mate. The one consistent thing we heard from everyone is that it is a “tradition.” It is the “custom”, it’s just what we do and drink. In their discussion with us, they told us that it is a way of being social, of sharing and connecting. Some also said that mate served as a “pick me up” beverage either in the morning, instead of tea or coffee, or in the afternoon to get through the rest of the day. The one thing that was very clear was that every moment spent drinking mate was special and was celebrating sharing and friendship. The pride at which they spoke about mate was evident. More than a drink, mate is a lifestyle! 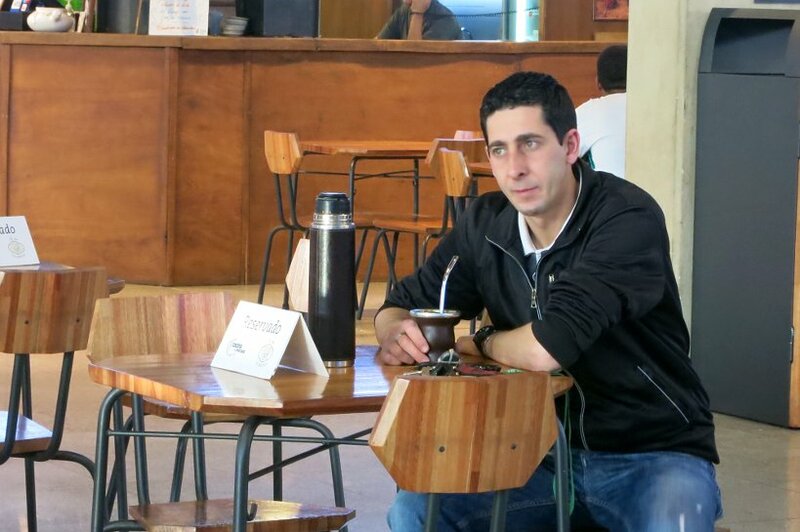 Being on this food quest in Uruguay, it would have been impossible not talk about mate. It is deeply rooted in the culture and one cannot miss the shiny aluminum thermos flasks that accessorize every outfit. Both Claire and I tried drinking mate and needed to first get used to its bitter taste. It does not taste like coffee but more like a dark bitter green tea with a unique taste of herbs and plants. At first we found it too bitter, until we discovered that you can add sugar to it. This made the taste much more tolerable. With the sugar we realized that we can acquire the taste and drink it more frequently. Even though one is sharing the bombilla (metal straw) and essentially ‘swapping saliva’, there is a comfortable feeling of sharing, friendship and connection. Honestly, we could get used drinking mate for the social aspects of it as well as the health benefits. Mate has many benefits and is powerful source of health and well being. Outside of South America, you can also find mate being consumed in Germany, France, Canada, UK, Australia and the U.S. 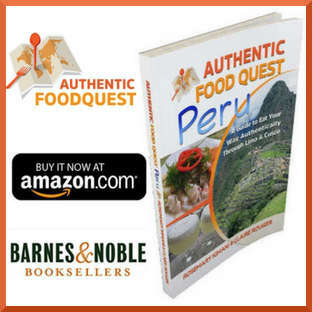 If you are interested in getting your hands on this magical beverage, you can order it on Amazon and can also find locations near you on this yerba mate blog. Es la sinceridad para decir: “¡basta, cambiá la yerba!”. 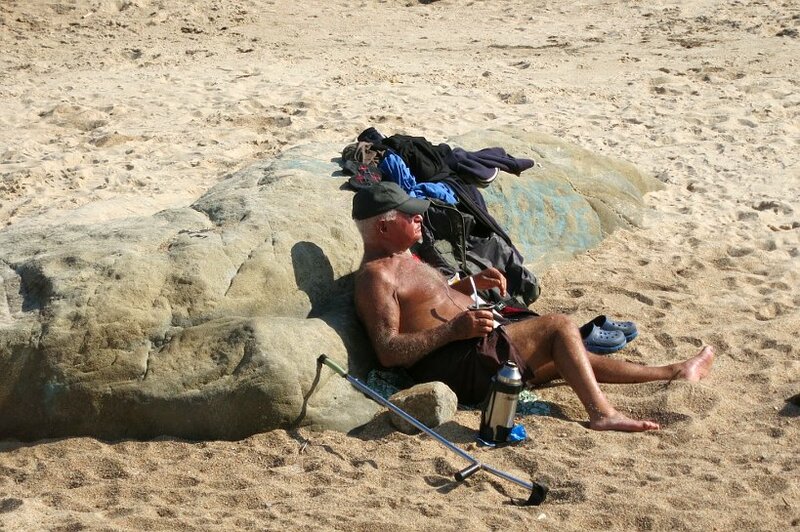 It is the solidarity to put with these washed out mates because the conversation is good. The conversation, not the mate. It is the respect for the times to talk and to listen, you talk while the other drink and vice versa. 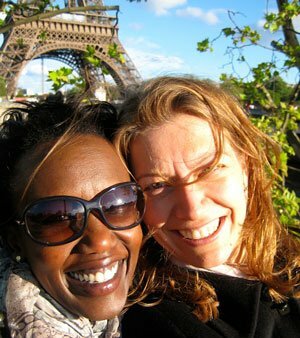 It is the friendship in this moment. It is the sensibility for the water simmering. It is the modesty of whom prepared the best mate. It is the generosity to give until the end. It is the fairness of one to another. It is the obligation to say “thanks”, at least once a day. Fascinating! I am an avid tea drinker – every morning instead of coffee – and I have tried mate, but it makes me a little crazy. I get very jittery and anxious. Did you meet any locals who are affected in this way? Thanks Rebecca! Interesting that it made you jittery. We haven’t heard anyone affected that way. We also tried it ourselves and we didn’t have that experience. We understand that there are many different types of mate and some are stronger than others. One of the most interesting observation is how much mate is part of the culture. 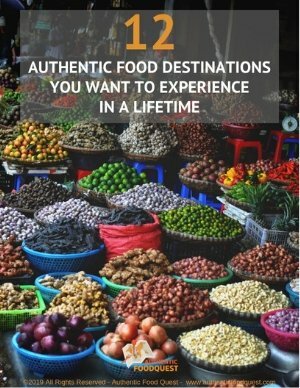 I’ve just read this, thank you for your lovely insight about our culture. Yes; many of us are affected like Rebecca. Different brands of Yerba Mate have different mixes, some of them are “stronger” than others, some of them have some other plants mixed, and we choose the brand according on how it affect us. Also, some people know how it affects them and how to prevent it; for example, “I won’t drink mate after the afternoon because then I can’t be able to sleep at night”.